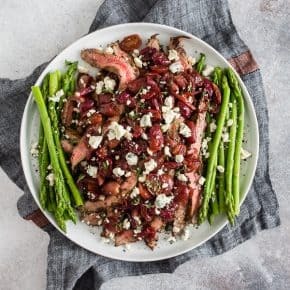 This grape and blue cheese flank steak is the perfect romantic meal and it’s ready in JUST 30 minutes! 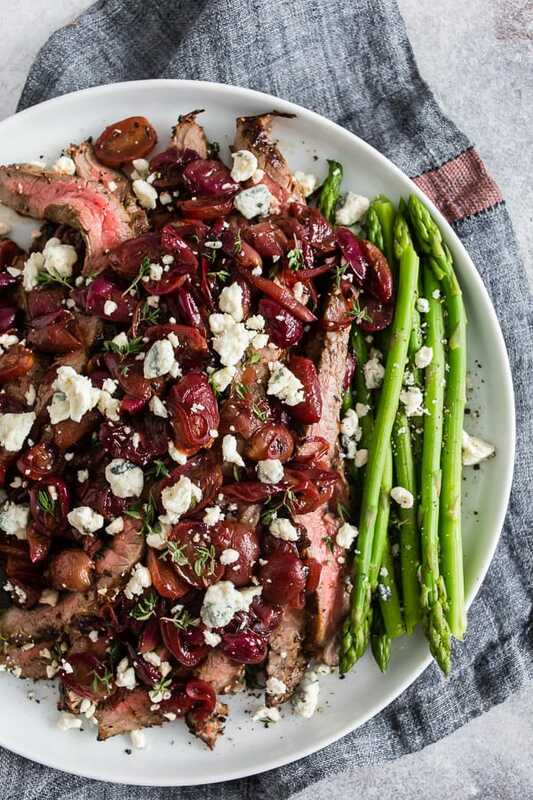 Herb marinated flank steak cooked on the stovetop and topped with balsamic sautéed grapes and shallots and sprinkled with blue cheese – what’s not to love? Art and I never go out for Valentine’s Day. I hate the crowds, I hate the fixed menus and I hate that it’s February and I’m forced to bundle up and wear snow boots to dinner. Usually, Art and I just switch off who cooks for v-day and dine on fancy food in the comfort of our home. Yeah, I hate wearing real clothes at home. I’m a PJ girl through and through. Last year I made Art pizza for Valentine’s Day but this year I wanted to spruce things up. 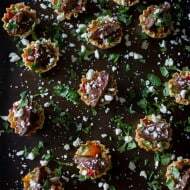 I wanted to come up a delicious dish to share on the blog that is Valentine’s Day and every day delicious. 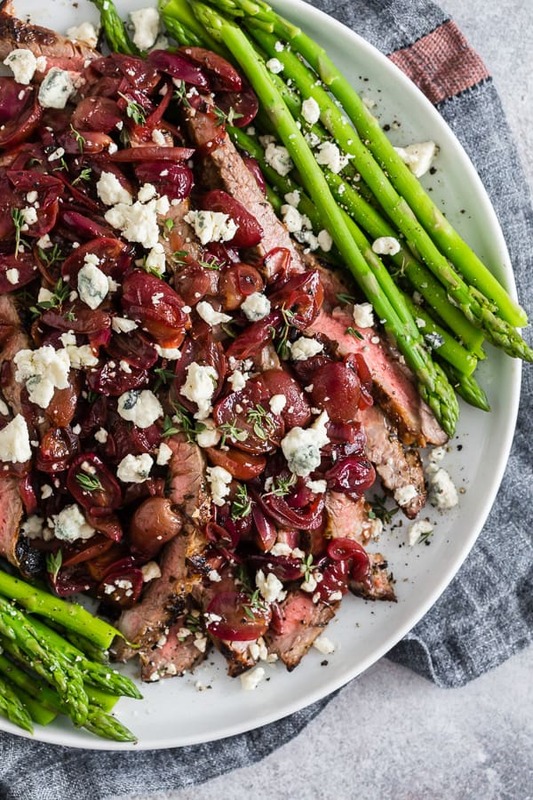 This grape and blue cheese flank steak is just that! There are a lot of things I love about this dish but my top favorite things are that it’s ready in 30 minutes and all made in the same pan! How freaking easy?! Oh, and if you’re one of those “ugh, fruit with my meat?” kind of people you need to give this a try. I think it will change your mind after the first bite. Who wouldn’t love sweet grapes over beefy flank steak sprinkled with blue cheese? Sweet baby J it’s amazing! I not only made this dish as a way to impress your sweetheart I also made this dish to help support Cookies for Kids! All the information on the fundraiser can be found below the recipe. Make sure to donate! 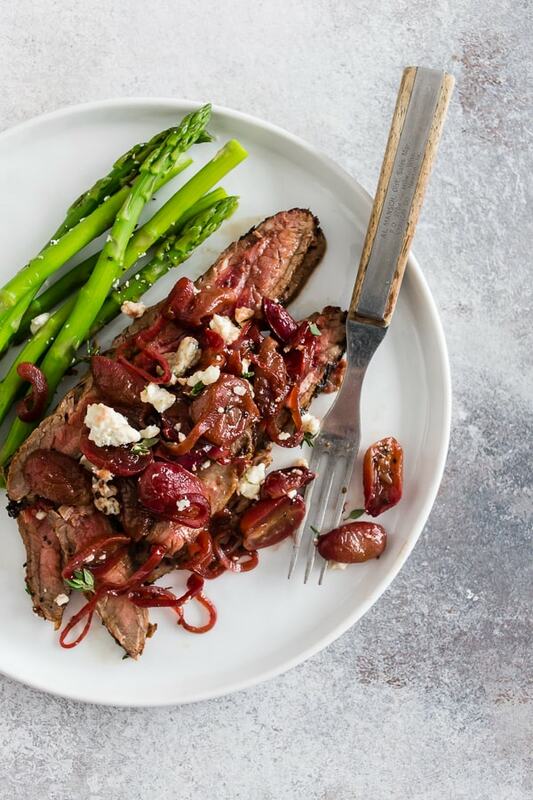 This grape and blue cheese flank steak is the perfect romantic meal and it's ready in JUST 30 minutes! 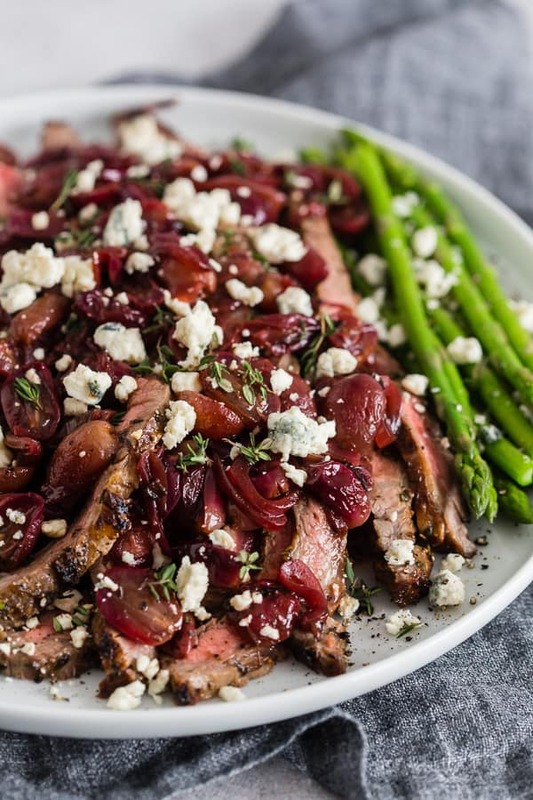 Herb marinated flank steak cooked on the stovetop and topped with balsamic sautéed grapes and shallots and sprinkled with blue cheese - what's not to love? 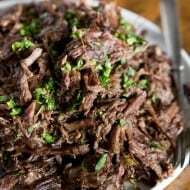 In a large bowl add flank steak, 2 tablespoons olive oil, minced garlic, rosemary, thyme, kosher salt and black pepper. Mix it all together to help coat the steak. In a large skillet add 1 tablespoon olive oil and set over medium-high heat. When the oil is hot add in the flank steak and cook 5-7 minutes per side. The meat will be resting after cooking so it will continue to cook off the heat. When the meat is browned on the outside and rare in the middle take it out of the pan, place on a platter and top with foil to keep warm. In the same skillet add the grapes and shallots and cook for about 10 minutes just until the grapes are warmed and softened. Add the balsamic vinegar and cook for a few minutes longer just to help the balsamic combine with the grapes and shallots. Thinly slice the flank steak, top with the grape mixture and sprinkle with blue cheese. I would have never thought to combine grapes and blue cheese. I can see how beautifully the balsamic sautéed grapes and shallots would work perfectly with the blue cheese! 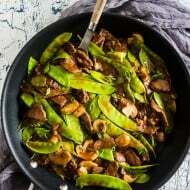 This recipe has wonderful flavors, and looks delish! Ever since I saw this on Facebook, I’ve been obsessing… this looks SO amazing!! SO many amazing things going on in this dish! I LOVE it!! Such a great steak flavor! My husband would love this! My husband would love this! This is definitely a spruced up dinner to celebrate Valentine’s day. I’ll just get the kids a pizza, lol! What a creative flavor combo! I will have to try it out soon! This will be on the dinner table very soon.